It’s no ordinary birthday party. Sure, there are balloons and gifts and cake. Laughter and hugs. But this gathering is about more than that. 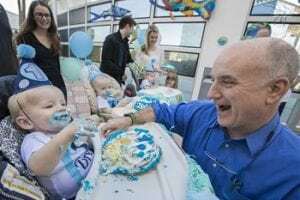 Under a cloudless sky, on the “pirate deck” of Johns Hopkins All Children’s Hospital, three vibrant 1-year-olds are lined up in high chairs with varying degrees of blue icing smeared on their little faces and fingers. The babies are delighting in fists full of their first birthday cake as family, friends and hospital staff cheer them on. The very fact that they’re eating cake—or eating at all—is no small victory. These are CDH babies. One-year-olds Drew, Beckham and Zachary were each born with congenital diaphragmatic hernia. All were “left liver up,” the most severe anatomic subset of CDH. Two required prolonged heart-lung bypass called extracorporeal membrane oxygenation (ECMO). Each child is lucky to be alive and, yes, well. Congenital diaphragmatic hernia (CDH) is a birth defect where the diaphragm, the muscle between the abdomen and the chest, does not develop properly. Abdominal organs migrate up through the resulting hole into the chest, squeezing off healthy lung growth. The condition is so severe that parents are commonly asked if they want to consider terminating the pregnancy. But families from around the country who are faced with this dilemma are learning they have a different option. They’re learning about the 95 plus percent survival rate of the CDH program at Johns Hopkins All Children’s Hospital, under the direction of David Kays, M.D. His team is achieving outcomes that give families like these a chance to celebrate a lifetime of birthdays. “The boys have met milestones, they’ve come off oxygen, and they’ve done things to make us so proud,” says Joy, mother of Drew. Drew’s parents came up with the idea of the small birthday gathering while planning their child’s first-year follow-up with Kays. They not only wanted to thank the clinical staff, but they also wanted to reconnect with the families they met at the hospital and with whom they developed extraordinary bonds. Drew and his parents, Joy and Andrew, Zachary and his parents, Heather and Jason, and Beckham and his parents, Amanda and Greg, all spent time together in the cardiovascular intensive care unit and the neonatal intensive care unit. For weeks, and then months, they fought for their babies’ lives. They shared meals, advice and elevators. They laughed and cried together, as they willed their babies to get stronger. Even now, a year later and with some miles between them, the families stay connected. They make plans to see each other. They try to schedule appointments on the same day, and when they are apart, they share advice and milestones. The support system for the birthday boys remains intact. At one point during the party, Kays takes a knee, getting eye-level with the baby most decorated with frosting—the one who had managed to devour nearly half of the birthday cake in record time. Previous post: It is strawberry season! Next post: More Time with Patients Can Lead to Improved Care.